Bridesmaids are the golden girls of weddings. They run here to there, attend to their bridesmaids duties, shed a few tears and still manage to look beautiful! 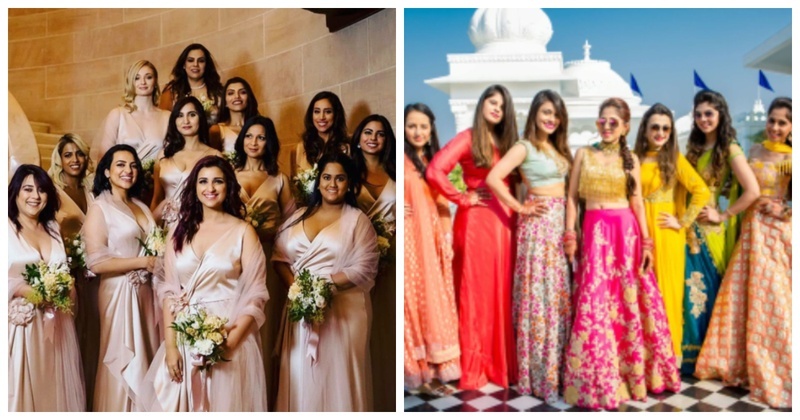 Here is a list of all those bridesmaids who wowed us with their looks, pictures and zeal in 2018 weddings! 1. Both these bridesmaids are totally rocking their lehenga and saree! 3. Shiv Shakti’s white lehenga with floral accent is one of our favourites! 5. Ash grey lehenga is the answer to all your wedding couture queries! 7. The monochrome bride who chose ivory lehengas for her bridesmaids definitely made the right choice! 8. Loving the teal, ladies! 10. Fashionista bridesmaids that know what’s trendy! 11. This bridesmaid’s ivory lehenga is so pretty! 12. Powder blue silk sarees, perfectly contrasting the bride’s fuschia pink lehenga! So, are you all set for your BFF’s wedding?